The Saint-Alexis Plateau is the perfect place for a visit that is off the beaten path and close to nature. 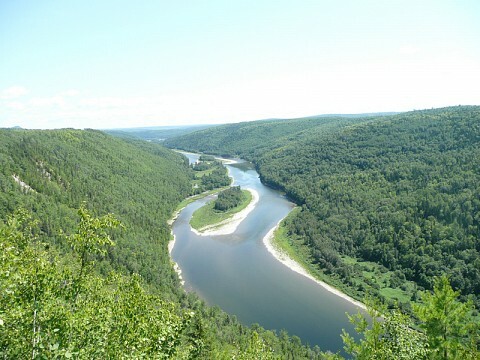 From its promontory, a lookout offers a breathtaking view of the Restigouche River winding its way along the mountains. The trail Les chutes du Ruisseau Robitaille (Robitaille Stream waterfall trail) leads to cascades surrounded by enchanting settings. In autumn, the surrounding forest will take your breath away with its extravaganza of colours. Depending on the season, the land lends itself to ecotourism activities, including wild berry picking, fishing, canoeing, hiking, wildlife watching, visiting sugar shacks (April), hunting, mini-golf, snowshoeing and snowmobiling.